Sometimes a second book is required for me to get a feel for a series, and this is certainly one of those cases. When the Heavens Fall was a novel that gave me mixed feelings, because while it didn’t exactly sweep me off my feet, I did genuinely enjoy it for the new and refreshing sword-and-sorcery fantasy that it was. In any event, it made me curious to tackle the sequel, Dragon Hunters, to see how the chronicle will continue. What I found caught me by surprise. As it turned out, this novel is rather unlike the first one; not only do the stories differ in tone and style, Dragon Hunters also follows a brand new cast of characters and takes place in a different setting. But in spite, or perhaps because, of this huge departure, I liked the book. I liked it a lot. One does not often find that subsequent volumes in an epic fantasy series can be read as standalones, but I believe this can be done here. Lore-wise, the plot of Dragon Hunters has strong ties to When the Heavens Fall, but other than that, we’re looking at a whole new ballgame. The story first begins in the period leading up to Dragon Day, an annual event celebrated by the raising of the Dragon Gate. A sea dragon would be allowed to pass into the Sabian Sea, where it will be subsequently hunted by the gathered water-mages who collectively make up a ruling body called the Storm Lords. One of them, the powerful Emira Imerle Polivar is being pressured to relinquish her reign, though she is not about to step down quietly. Conspiring with the Chameleon priesthood, she arranges for two of their members to infiltrate the heavily guarded citadel and sabotage the Dragon Gate. Ruining the ceremony would deal a humiliating blow to the Storm Lords, which is exactly what Imerle wants. However, it appears that others have been targeting the Storm Lords too, as evidenced by the deadly assassins on the hunt, using the confusion sowed by the conspiracies and chaos to their mysterious benefactor’s advantage. Considering my reading preferences, it’s probably no surprise that I found getting into this second volume was much easier and faster compared to the first. After all, I love my maritime fantasy, and I also love dragons. In Dragon Hunters, Marc Turner masterfully spins an exciting and cohesive tale of nautical adventure featuring these majestic leviathans, and it captured my imagination from the start. Unlike the first book, which saw four disparate characters come together in their shared quest to find a stolen object, the unifying theme of this sequel is not of a search, but of a hunt. That little difference alone gives this story a much more animated and thrilling sense of urgency. For one thing, all the characters here are working against the clock. Karmel and Veran, the two Chameleon agents tasked to sabotage the Dragon Gate, are on a heist-like mission trying to complete their objective while struggling with mistrust and hidden agendas within their priesthood. Then there’s Kempis Parr, a city watchman hot on the trail of an assassin who has always managed to stay one step ahead of him, slipping from his grasp each time he draws close. And finally, there’s the grand dragon hunt itself. The plot to ruin Dragon Day notwithstanding, you didn’t think we’d get a book called Dragon Hunters without some dragon hunting action, did you? If dragons are what you want, then you definitely won’t be disappointed. 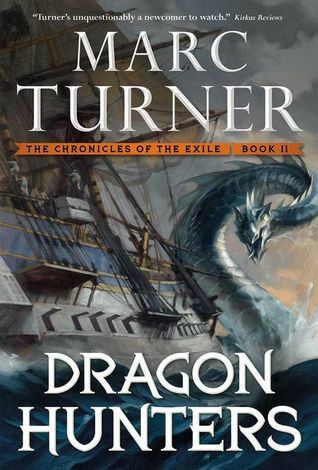 Turner’s dragons are marine monsters, vicious predators that will give the Storm Lord ships a run for their money. While I found When the Heavens Fall to be a slower novel that took nearly until the midway point to pick up speed, clearly I had none of those problems here. Compared to its predecessor, Dragon Hunters isn’t just like a whole different book, it IS a whole different book. For this reason, I have a feeling that opinions on it will vary wildly. For me personally though, it is an example of a sequel that beats out the previous book when it comes to pacing and scope. Overall, I feel that the story has a more “blockbuster” vibe to it, by which I mean its reach is considerably more epic, encompassing the lives of a greater number of characters and resulting in far more serious ramifications for the world—in other words, not a bad deal at all. All told, Dragon Hunters was a great book and hooked me where the first one didn’t. I’m glad I gave this sequel a go, because in terms of my excitement level for this series, I know that I’m no longer sitting on the fence: I desperately need to get my hands on the next installment! Marc Turner has completely sold me on his excellent world building and characters, and I can’t wait to see what’s next in Red Tide, The Chronicle of the Exile part three. Glad to hear you enjoyed this one more than Book 1. I think I may try to get to this one soon(-ish). Yes, if you weren’t sure after book 1, you should still give this one a shot – completely new direction and new tone. This sounds really interesting. I don’t think I’ve ever read a maritime fantasy story before. I might have to check it out. I like the idea of a dragon being a huge predator as well. I feel like most of the time when I see a dragon in a story it’s a misunderstood creature that the protagonists have to try and save. it’s surprising to see it’s that different but in a whole I think it’s a bit too fantasy for me there… but dargons… yay for dragons! I just got home, and I just got a copy go this book in the mail! What a coincidence! 😀 I missed out on When the Heavens, but Marc said this can be read as a stand alone, so I told him I’d give it shot. It’s good to hear that you liked this more and that you thought it could be read as a standalone. And you have a quote of the back cover! OMG I had the book and didn’t even notice! Shows how observant I am, lol, thanks for letting me know! Yes, it can definitely be read as a stand alone, and like no worries about missing anything at all. I loved that! I have a copy of this which I’m hoping to pick up shortly so I’ve not fully read this but I’m so happy you have it a good rating – makes me even more excited to pick up – if that cover hadn’t already done that as it is! Yep, and so is the dragon 😉 Though I like the UK cover a lot too, but the dramatic angle on the US cover wins!